Can you believe the 2014 season is over? After 16 weeks of excitement and turmoil, we've got our champions. If you were one of the winners, congratulations on your success. If you were not a winner, good luck next year. 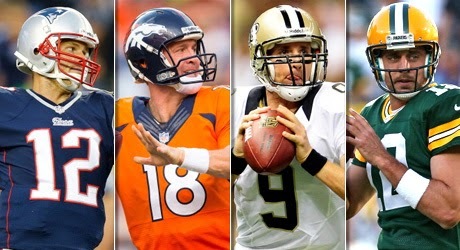 Now, let's analyze the Quarterbacks of 2014, and rank how they did in weeks 14-16. 1) Cam Newton (when healthy) was the best fantasy football quarterback of the 2014 playoffs... If you started him in weeks 14 and 16, you likely won the QB match-up... And since we all knew Cam was out for week 15, chances are you were able to grab a solid backup for that week. 2) Tony Romo and Matt Ryan were the most consistent QBs in the Fantasy Football Playoffs, scoring no less than 20 and 16.6 points respectively, over the stretch. 3) Ben Roethlisberger steadily scored worse each week of the playoffs, while Ryan Tannehill ramped up his performances over the playoff run. 4) Chances are, if you had Peyton Manning, Aaron Rodgers, Drew Brees, Matthew Stafford, or Andrew Luck, you likely lost one of your three playoff games, as all five of the consensus star QBs, had a performance outside the top 20 in the playoffs. 5) During the FF Playoffs, Teddy Bridgewater, Alex Smith, and Derek Carr werebetter than Brady, Flacco, Rodgers, Kaepernick, Rivers, Manning, Brees, RG3, Stafford, Luck and Dalton. B) Teddy Brigdewater looks to be the frontrunner for Rookie QB with the most upside... Manziel, Bortles and Carr all have some work to do to catch up. C) This may be the year to sell high on Roethlisberger. He had a massive year, but will be 33 next year, has taken a ton of punishment over his career, and L. Bell may become the focal point of the offense going forward. D) Matthew Stafford is a solid buy low candidate. He had a rotten 2014, but still has a ton of weapons and another year with offensive coordinator Joe Lombardi, which should create a bounce back season.